Semi-autonomous grav platforms built to accept a variety of different loadouts, including lethal and non-lethal options. Shield Drones will advance beside the Cyphers while Gun Drones provide covering fire from the rear. 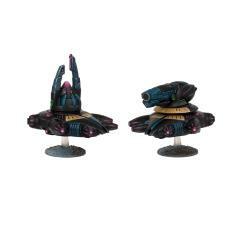 This set contains 2 premium plastic Asterian miniatures with bases.